Prestige is a brand of beer produced by the Heineken-owned Brasserie Nationale d’Haiti in Port-au-Prince. 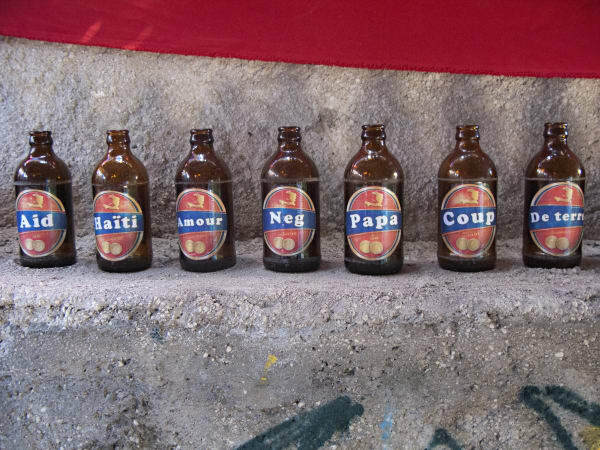 With 98% market share it is the best-selling beer in Haiti. I invited Haitians to warp the label of Prestige. Through a series of interviews, I explored ways in which Haitian identity may be reflected and distorted by this consumer product. Prestige was commissioned by the 3rd Ghetto Biennale in Port-au-Prince – December 2013. Images courtesy Jason Metcalf (Multiversal Services), Laura Heyman and Michel Lafleur.